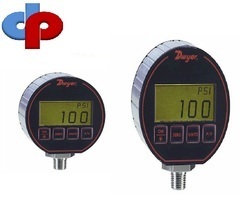 The SERIES DPG-200 Digital Pressure Gage has a precise ±0.25% full scale accuracy. The 4 digit digital display will reduce the potential for errors in readings by eliminating parallax error commonly produced with analog gages. The DPG-200 is packaged in a durable extruded aluminum case designed to meet NEMA 4X (IP66). The unit is powered by 12-24 VDC/VAC and contains two alarm set points along with a 4-20 mA process output. A four-button keypad allows easy access to features. 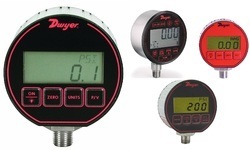 These features include backlight, peak and valley, auto zero and conversion of the pressure units. Digital pressure gage, selectable engineering units: -14.70-0 psig, -1.033 kg/cm², -1.013 bar, -29.93" Hg, -33.94 ft w.c., -33.06 ft seawater @ 4°C, -101.4 kPa, -235.2 oz/in², -407.3" w.c., -1013 mbar, -1034 cm w.c., -760.7 mm Hg. Digital pressure gage, selectable engineering units: 15.00 psig, 1.055 kg/cm², 1.034 bar, 30.54" Hg, 34.61 ft w.c., 33.73 ft seawater @ 4°C, 103.4 kPa, 240 oz/in², 415.2" w.c., 1034 mbar, 1055 cm w.c., 775.7 mm Hg. Digital pressure gage, selectable engineering units: 30.00 psig, 2.109 kg/cm², 2.069 bar, 61.08" Hg, 69.21 ft w.c., 67.45 ft seawater @ 4°C, 206.9 kPa, 480 oz/in², 830.4" w.c., 2069 mbar, 2109 cm w.c., 1551 mm Hg. Digital pressure gage, selectable engineering units: 50.00 psig, 3.515 kg/cm², 3.448 bar, 101.8" Hg, 115.4 ft w.c., 112.4 ft seawater @ 4°C, 344.8 kPa, 800 oz/in², 1384" w.c., 3448 mbar, 3515 cm w.c., 2586 mm Hg. Digital pressure gage, selectable engineering units: 100.0 psig, 7.03 kg/cm², 6.895 bar, 203.6" Hg, 230.7 ft w.c., 224.8 ft seawater @ 4°C, 689.5 kPa, 1600 oz/in², 2768" w.c., 6895 mbar, 7031 cm w.c., 5172 mm Hg. Digital pressure gage, selectable engineering units: 200.0 psig, 14.06 kg/cm², 13.79 bar, 407.2" Hg, 461.4 ft w.c., 449.7 ft seawater @ 4°C, 1379 kPa, 3200 oz/in², 5536" w.c.
Digital pressure gage, selectable engineering units: 1000 psig, 70.3 kg/cm², 68.98 bar, 2036" Hg, 2307 ft w.c., 2248 ft seawater @ 4°C, 6895 kPa..
Digital pressure gage, selectable engineering units: 3000 psig, 210.9 kg/cm², 206.9 bar, 6108" Hg, 6921 ft w.c., 6745 ft seawater @ 4°C. 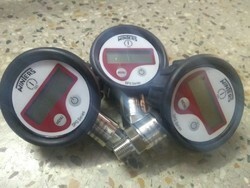 Digital pressure gage, selectable engineering units: 5000 psig, 351.5 kg/cm², 344.8 bar. 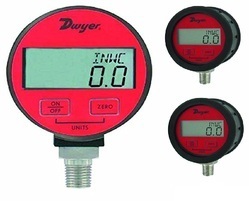 DM-1124 DigiMag® differential digital pressure gage, range 2-0-2" w.c. 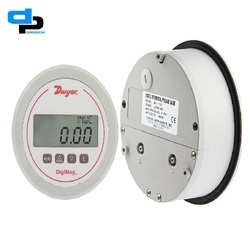 The Digi Mag Series DM-1000 Digital Differential Pressure and Flow Gages monitor the pressure of air and compatible gases just as its famous analog predecessor the Magnehelic Differential Pressure Gage. All models are factory calibrated to specific ranges. The 4-digit LCD can display readings in common English and metric units so conversions are not necessary. The simplified four button operation reduces set up time and simplifies calibration with its digital push button zero and span. 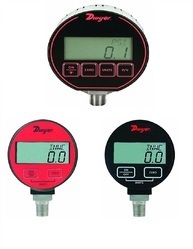 The Digi Mag Digital Gages are more versatile than analog gages with their ability to be field-programmed to select pressure, air velocity or flow operation depending on model. 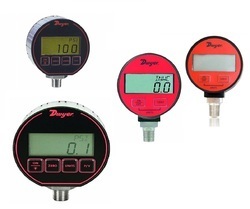 The DigiMag Digital Gages have an added feature for filter applications where a set point can be input where the display will blink when the filter is dirty, alerting the user that a maintenance action needs to occur. 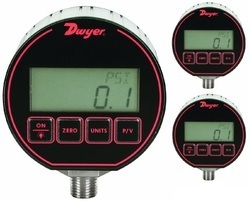 Programming the Series DM-1000 is easy using the menu key to access 4 simplified menus which provide access to, depending on model: security level; engineering units; K-factor for use with various Pitot tubes and flow sensors circular or rectangular duct size for volumetric flow operation; filter set point; view peak and valley process readings; digital damping for smoothing erratic process applications; display update to conserve battery life; zero and span field calibration. 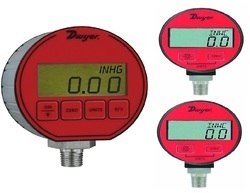 The Series DM-1000 DigiMag Digital Differential Pressure and Air Flow Gages possess a full-scale accuracy of 1% on ranges down to 2 in H2O and 2% accuracy down to the very low range of 1 inch to 0.25 in H2O. DigiMag Digital Differential Pressure Gages offer power versatility by working with 9-24 VDC line power or simply 9V battery power. If using line power and connecting the 9V battery, the battery will act as a back-up if line power is lost or interrupted. 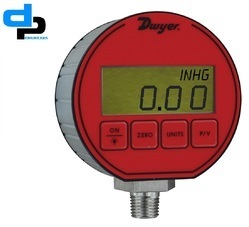 Looking for DPG 200 Digital Pressure Gaugue Dwyer USA Wholesle ?